Jean Sibelius, a Finnish composer and one of the most outstanding composers in Europe, brought the national musical culture to the world stage. His best compositions were written in the concerto and symphony genres, like Violin Concerto, a number of orchestral works . Symphony No2 presents in perfect harmony most important features of his artistic world: pastoral and landscape lyrics, some typical devices of scherzo and drama. The orchestration appeals by its natural way. It never becomes the end in itself but always continues the very idea of music. 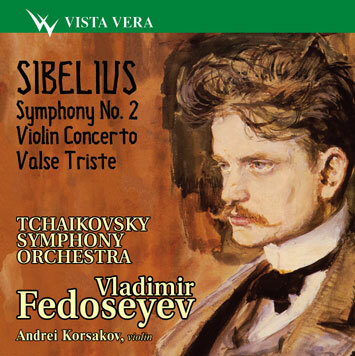 Sibelius’ long and happy life began with the dream of the career of a solo violinist. It was as a student of violin that he entered the Helsinki Musical Institute in 1885. Violin remained his love for the rest of his life. Concerto for violin and orchestra became the main work of the Finnish composer for the instrument. According to Erik Tawastjerna, the author of a fundamental book on Sibelius, "the composer was writing it for himself, or, to be more correct, for a virtuoso he once had a dream to become". An entry in Sibelius diary of 1915 says: "I dreamt that I had been twelve and a virtuoso". The composer achieved an ideal balance of the artistic and technical sides in the concerto. Valse Triste was written as a fragment from the music to the Arno Jarnefelt’s drama "Death". It comes at a key episode of the play. The principal character seems to see a ball where his mother among other guests is dancing. The dance is fading away than recommences until death comes to knock at the door. The play did not outlive its time and Valse Triste is for a long time perceived out of its context. The symphonic miniature sounds like a drama of life and death with the emphasis on deep sorrow and melancholy .not on the horror of death. An outstanding Soviet virtuoso violinist Andrei Korsakov ( 1946 - 1991) graduated from the Moscow Conservatoire where he studied under the tutorship of Prof. Belenky and Leonid Kogan. Prizewinner of the international Paganini competition in Genova, the competition in Montreal, M. Longue and J. Tibot Competition in Paris, the Queen Elizabeth Competition in Brussels, and Tchaikovsky Competition in Moscow. People’s Artist of the Russian Federation. Korsakov made quite a few recordings with Russian and European orchestras.